It is inevitable that over time dirt and dust can gather in the chamber of your camera, particularly if you change lenses in ‘the field’. When dust gathers on the sensor the tell-tale signs reveal themselves as dark ‘spots’ on your photos. (see image above). This shows particularly when photographing plain backgrounds such as sky or against a white/grey background. Having the sensor cleaned on a regular basis helps maintain the camera’s performance whilst enabling you to achieve the best possible results from your camera. We offer a 3 day, next working day and same day sensor cleaning service. If you are interested in booking a sensor clean, please call us on 01595 694345 to book your sensor clean. We would ask that all cameras are brought in with a fully charged battery or mains adapter, as most cameras require an 80% charge or more to perform the clean. 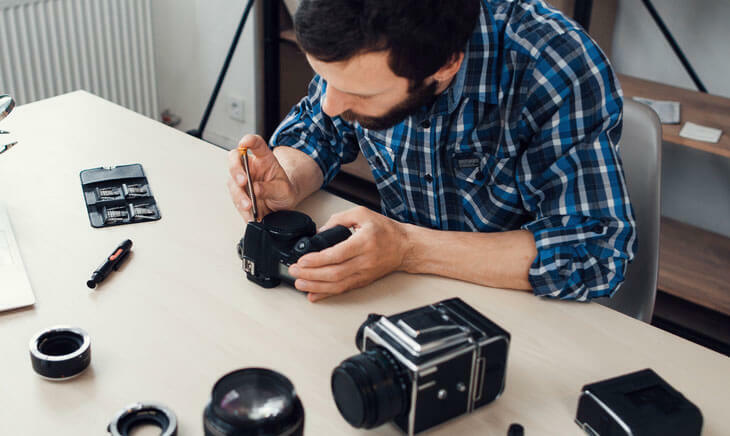 While conducting the initial checks on the camera, we will contact you before continuing if we feel it is unsafe to clean the sensor – due to existing scratches or stubborn marks that could cause further damage. You will be provided with a report of the checks/cleans with the return of your camera. Please call us on 01595 694345 for more information.